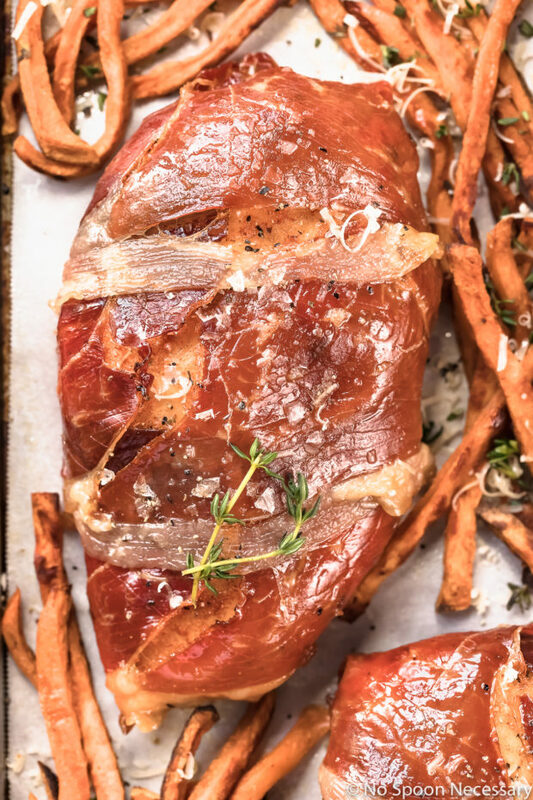 This Brown Sugar Prosciutto Wrapped Chicken with Sweet Potato Fries is made with a handful of ingredients and easily baked together on a sheet pan! 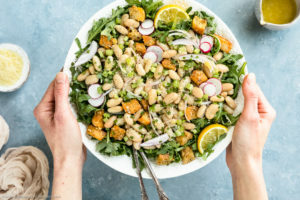 Quick to prepare and packed with flavor, this elegant dinner is great for busy weeknights or perfect for entertaining during the holiday season! 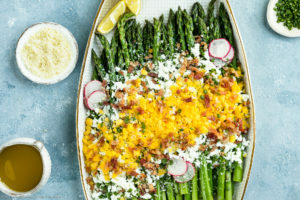 Since the holiday season is hectic and full of busy weeknight dinners mixed with elegant weekend entertaining, I decided to share a dish that is perfect for any (and every) occasion! 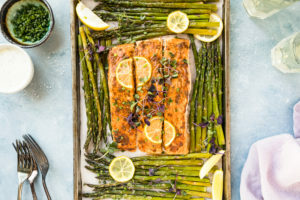 Today’s sheet pan dinner is quick and and easy enough for frenzied weeknight meals, yet impressive and fancy enough for holiday entertaining! Basically, this dish is a life saver. 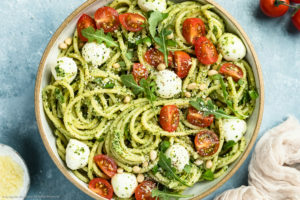 So, make sure you keep this recipe in your back pocket, because it’s your ticket to staying sane when dinnertime rolls around! fries dusted with fresh thyme and spicy chili powder. 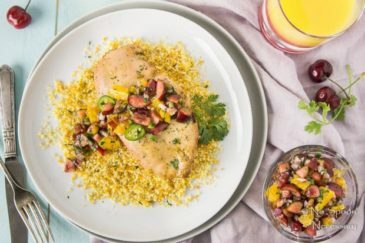 This easy chicken dinner only requires a handful of ingredients and all comes together on a sheet pan! It’s great for busy weeknight dinners or a perfect option for stress-free, easy entertaining! Packed with sweet and spicy flavors, this sheet pan dinner is guaranteed to be a hit! What is prosciutto wrapped chicken? What is prosciutto chicken? Prosciutto wrapped chicken, or prosciutto chicken, is simply chicken (typically breasts) that have been wrapped with thinly sliced prosciutto and then baked until the prosciutto is crispy. What is the difference between chicken saltimbocca and prosciutto wrapped chicken? 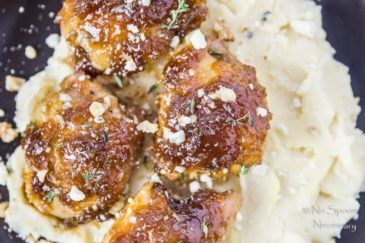 While chicken Saltimbocca is an Italian dish made with chicken cutlets wrapped with prosciutto and sage and served with a white wine sauce, prosciutto wrapped chicken is typically made with lightly pounded chicken breasts. As well, chicken prosciutto may or may not include sage and skips the wine sauce. How long do you cook prosciutto wrapped chicken? 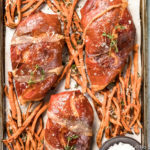 Prosciutto wrapped chicken should be baked in an oven preheated to 425 degrees F for 18-25 minutes, or until the chicken meat is no longer pink and the prosciutto is browned and crisp. 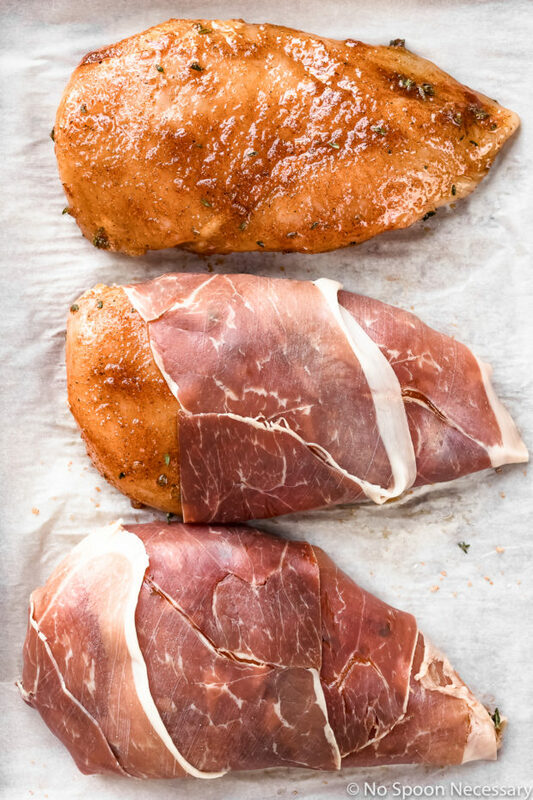 The prosciutto chicken recipe below calls for gently pounding out the chicken breasts to and even 3/4” thickness. Pounding the chicken breast out not only ensures even cooking, but it also slightly tenderizes the meat. Make sure you read the recipe all the way through before proceeding. The recipe is written to make the most efficient use of your time and calls for preparing the sweet potatoes and chicken in stages (fries first and chicken second). It is written this way because the fries go into the oven first and then the chicken is added later. If you aren’t good at kitchen prep, I recommend you go ahead and prepare everything before baking, meaning prepare the fries, pound the chicken, rub the chicken with the brown sugar mixture and wrap the chicken in prosciutto before putting anything into the oven. 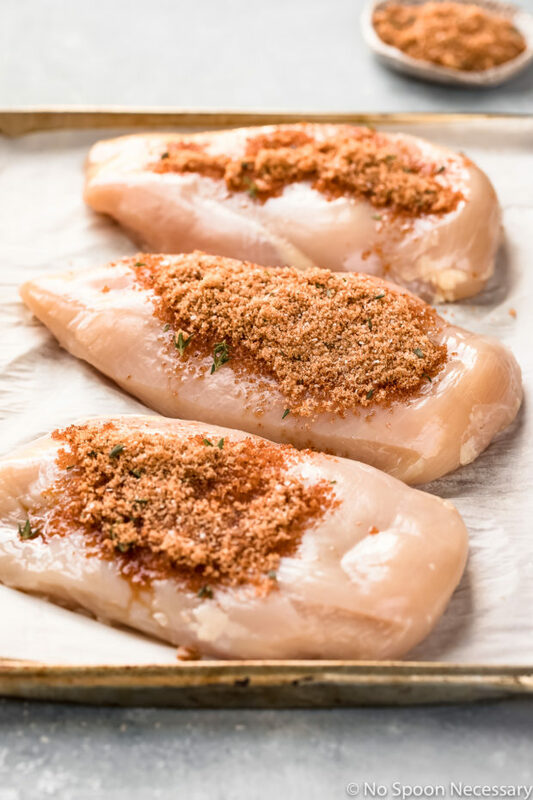 The exact cooking time for the chicken will depend on the size of your chicken breasts and how thinly you pounded them out. The time listed in the recipe is an approximation. You should always cook chicken all the way through and until no longer pink. If you use an instant read cooking thermometer, make sure to measure the temperature at the thickest part of the breast. It should be between 160-170°F (The FDA recommends 165°F). Make sure you allow the cooked prosciutto wrapped chicken breasts to rest for 3-5 minutes before slicing or serving. Resting the chicken allows the juices to redistribute and the prevents dry chicken. 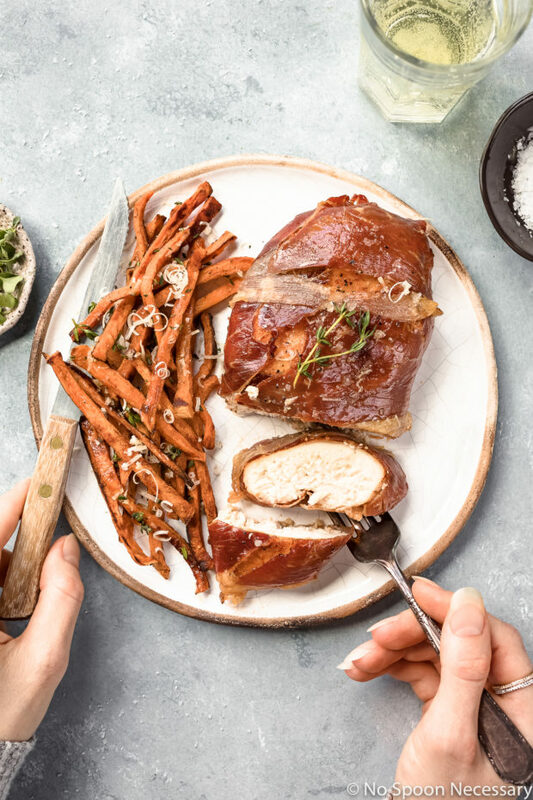 Easy to prepare, yet elegant and full of flavor, this Brown Sugar Prosciutto Wrapped Chicken with Sweet Potato Fries is perfect for any occasion! Until next week, friends, cheers – to sensational sheet pan meals! 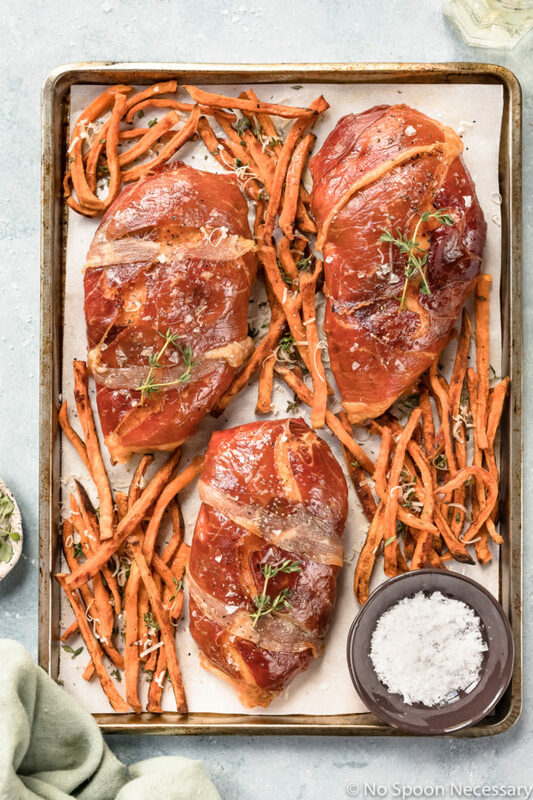 This sheet pan Brown Sugar Prosciutto Wrapped Chicken with Sweet Potato Fries is made with a just a handful of ingredients! 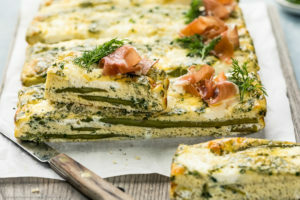 Quick to prepare and packed with flavor, this elegant dinner is great for busy weeknights or perfect for entertaining during the holiday season! Preheat oven to 425 degrees F. Line a large sheet pan with foil for easy clean up (for the chicken) and spray another large sheet pan with non-stick cooking spray (for the sweet potatoes). Set both aside. In a small bowl, mix together brown sugar, ½ teaspoon thyme, paprika, ½ teaspoon chili powder, garlic, ½ teaspoon salt and ¼ teaspoon pepper. Set aside. 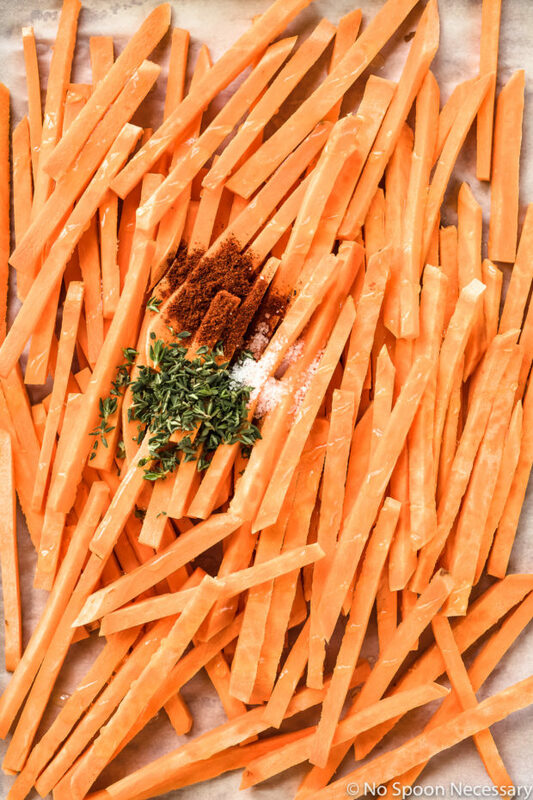 On the sprayed sheet pan, toss the sweet potatoes with olive oil, 2 ½ teaspoons thyme and ¾ teaspoon chili powder. Season generously with salt and pepper. Spread the fries out in a single layer, making sure not to overcrowd the pan. Cook fries first: Transfer the fries to the oven and bake for 15 minutes. Remove from oven and flip potatoes. While the fries are partially baking: Gently pound chicken breasts to 3/4’’ at the thickest part using a meat mallet or rolling pin. Sprinkle brown sugar mixture all over chicken and use your hands to coat the chicken. Wrap 2-3 slices of prosciutto around each chicken breast so that the ends of the prosciutto are underneath the chicken breast to prevent unwrapping when cooked. Press the prosciutto together to seal. Transfer the chicken to the lined sheet pan. Add the chicken to the oven: Add the fries back to the oven, along with the chicken and bake for 18-22 minutes, or until the chicken is cooked through and no longer pink in the center (an instant read thermometer inserted into the chicken should read 165 F), and the fries are tender, yet crisp. To serve: Remove from oven and tent chicken loosely with aluminum foil and allow to rest for 3-5 minutes before serving. Sprinkle chicken and fries with optional garnishes and enjoy! Make sure you gently pound out the chicken breasts to an even 3/4'' thickness. Pounding the chicken breast out not only ensures even cooking, but it also slightly tenderizes the meat. Make sure you read the recipe all the way through before proceeding. 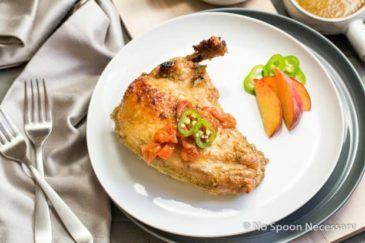 The recipe is written to make the most efficient use of your time and calls for preparing the sweet potatoes and chicken in stages (fries first and chicken second). It is written this way because the fries go into the oven first and then the chicken is added later. If you aren't good at kitchen prep, I recommend you go ahead and prepare everything before baking, meaning prepare the fries, pound the chicken, rub the chicken with the brown sugar mixture and wrap the chicken in prosciutto before putting anything into the oven. I’ve got only one question: how did I manage to miss this recipe last week? (Indeed, there’s another question: how didn’t you ship this dish to me?). This looks phenomenally good…chicken, prosciutto, thyme, paprika, sweet potatoes…Love this brown sugar caramelization. Perfection, Chey! 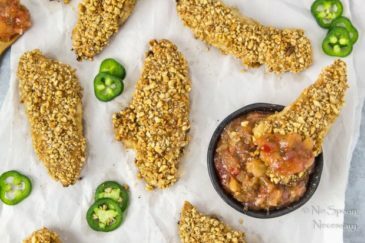 Great way to fancy up a chicken breast! The spices and salty prosciutto add a lot of flavor to the chicken and those sweet potato fries, can’t go wrong there! I love sheet pan dinners like this for busy weeknights! 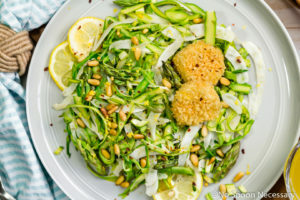 This one may be easy, but looks fancy enough for a dinner party! So many wonderful flavors!! Putting this on the menu!! So many fall flavors rolled into one! AND it’s easy enough for a weeknight. I love sweet potato fries and can sometimes even get my kids to eat them. Can’t wait to try this one. I love easy, tasty sheet pan meals Chey! So perfect for the busy holiday season ahead. And this one looks totally spectacular! Tom and I would both enjoy this one, and you know he’s picky, but he’d love everything about this one. I bet he’d want me to sneak some cheese under that prosciutto! Can’t wait to give this one a go! Happy early weekend! You say sweet potato fries, I say I’m in. This is such a perfect dinner idea, Chey! I love anything made in one pan, and you get bonus points for including fries :). I have to try this one asap! Have a great weekend, girlie! This looks simply amazing! I can’t wait to make this ASAP! Such a fun and delicious idea of wrapping up the chicken breast with brown sugar and prosciutto.